YouTube Ransomware is the name of a recent malware threat that is not indeed a ransomware as its name suggests. This infection is a Trojan program that locks your screen but it does not encrypt your files at all. As a matter of fact, it does not even give you an option to transfer money or contact the cyber criminals behind after this attack. Yet, you have to enter a special code to be able to unlock your screen and go on with your virtual life. Do not worry; we have a solution for you to eliminate this annoying threat. Although your files are in no danger from this Trojan infection, it is important that you remove YouTube Ransomware from your computer if you plan to use it in the future. Please read our full article to understand better how you may have infected your PC with this threat and how you can avoid the next possible attack. There are mainly two ways for you to infect your system with this Trojan. First of all, if you tend to visit suspicious file-sharing websites like torrent and freeware pages to download free programs and other files, you need to know that these pages are one of the most likely places to download bundled malware threats. Such a malicious software packages can easily contain a number of malware infections, including Trojans, adware programs, browser hijackers, backdoors, and potentially unwanted programs as well. It should be clear that it is important for you to avoid the use of suspicious torrent and freeware pages because not only the programs you download from there can be malicious but also any third-party ad these pages display. You are quite lucky this time because you can delete YouTube Ransomware without risking losing your personal files to this attack. The other likely way for you to infect your system with this threat is to open a spam e-mail and view its attachment. This Trojan infection may be disguised as an important attacked file (image, video, or document). You need to be extra careful around your e-mails because cyber criminals are getting better at their spamming tactics. You may find a mail either in your spam folder or even in your inbox that seemingly has come from a government agency, the local police, a reputable hotel, or parcel delivery service. Why would you doubt such a mail, right? Well, unfortunately, wrong. The truth is that crooks can make spam look like coming from anywhere they want, even one of the e-mail addresses from your contact list, which you definitely would not question. However, checking out the attachment is the worst you can do since this file is indeed a malicious executable that activates this attack. You can thank the God of IT that this Trojan screen locker does not encrypt your files. 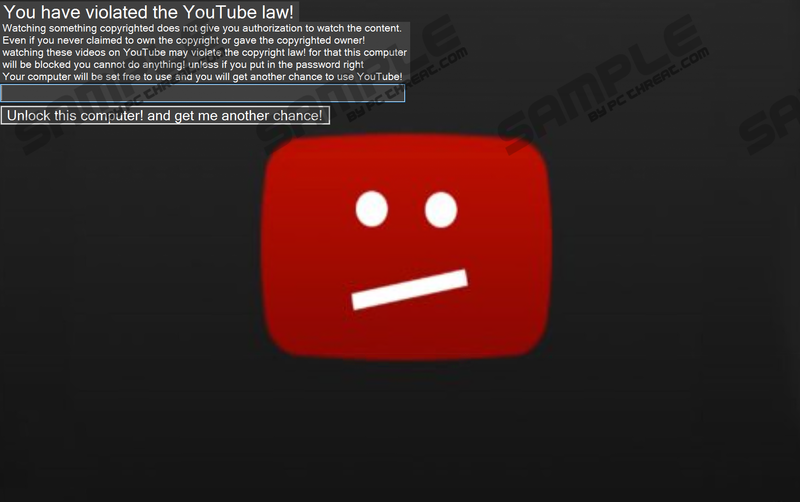 Still, it is important that you remove YouTube Ransomware the moment you notice its presence. This Trojan infection occupies your screen with its warning window that has black background and a huge YouTube sad face icon that you usually see when a video in no longer available on YouTube. This window locks your screen, which means that you cannot move away from it or close it either. It seems that you have been locked out of your computer. This note says that “You have violated the YouTube law” and claims that you have been watching copyrighted content and this is why you are punished with this lockdown. The only way for you to unlock your computer is to enter the right code in the field below. Although this Trojan is referred to as ransomware, it does not encrypt your files at all and it does not even ask for money or contact either. So how are you supposed to get this code then? This is a good question and we can only answer “right here, on our site.” As a matter of fact, we have the code for you to unlock your screen, which is the first step for you to remove YouTube Ransomware from your system. Enter "law725" into the field on your lock screen and click on the button below. Now, the warning should be gone and you should be able to access your computer and your files, too. We recommend that you check your Task Manager for any suspicious process that could be running in the background and may be related to this attack and kill it. Then, you can delete all suspicious files you have downloaded recently possibly from a spam mail or by installing freeware bundles. Please use our instructions below if you want to do all this manually. If somehow you do not succeed, we suggest that you try to restart your computer in Safe Mode and then, remove the related files. This time you got lucky and your files remained intact. But you need to think of future attacks and realize that you need a better way to protect your computer if you do not want real damage to occur on your system or your identity stolen and used by cyber criminals in online frauds. We advise you to install a reliable malware removal application, such SpyHunter that can automatically filter out and erase all existing malware infections. Enter the unlock code ("law725") into the field on the lock screen and press the “Unlock this computer! and get me another chance!” button. Search the list of processes for any suspicious process and terminate it by pressing End task. Find and delete recently downloaded suspicious files. Quick & tested solution for YouTube Ransomware removal.